You asked for it, now here it is! I have assembled a fabulous collection of 50 recipes for you. This book is a great way to share Plain Chicken with your friends and family at the holidays! This makes a great for co-workers, your hair stylist, your secret Santa pal, your neighbor. This is also the perfect teacher gift. My Mom was a teacher, and she assures me that teachers don't want a candle or school supplies. They would prefer an awesome cookbook with tons of easy recipes for after work! Very cool Stephanie! I love them all. Happy Thanksgiving. Lets EAT! Congrats Steph and I'm impressed you could boil down so many of your delicious dishes to just 50. I believe you could easily do an entire book on appetizer & tailgating foods. Just ordered one for myself and one for Christmas for my cookbook-loving mother-in-law . Can't wait to get them! I see the Bacon/Cheddar/Ranch Pull apart on the cover....is the Cinnamon one in the book too? I just made it for Thanksgiving Brunch and it was delish!! Will there be a book signing anywhere? Or can we order signed copies? How excited are you???!!! Great news...Christmas gifts for all the women in my family! This is so exciting! Your blog is definitely one of my main go-tos for uncomplicated, delicious recipes. Your book is definitely going on my Christmas list! Congratulations on this step! This is so cool! I shared the link on my FB page. I'm ordering some now! 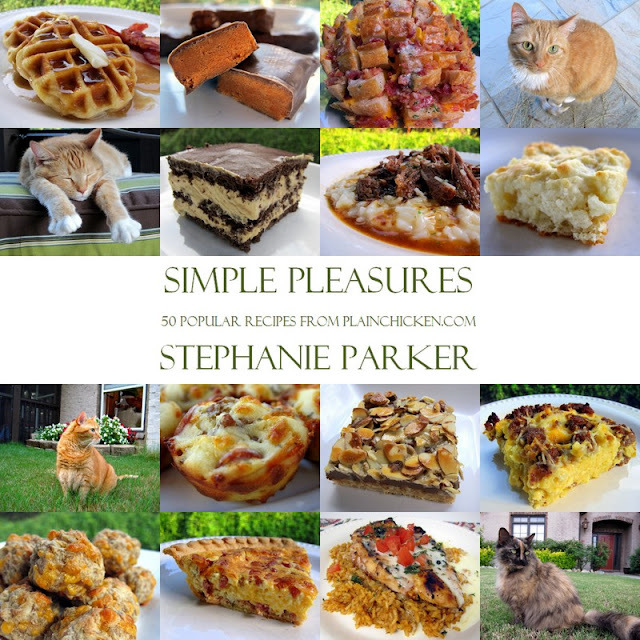 Hi Stephanie....I ordered your Simple Pleasures book and it came in the mail yesterday! I love it! I enjoy following your blog and I've tried many of your recipes. I agree that many of my favorites are in the new book. Happy Holidays!